Partnerships established today drive the solutions of tomorrow. Our network is expansive and draws on a variety of collaborations and partnerships with experts in their fields. 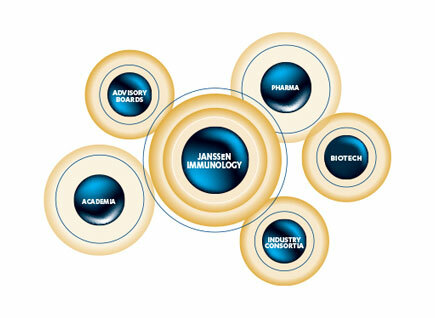 As a member of the Janssen Pharmaceutical Companies of Johnson & Johnson, we have the scientific expertise and global operations to translate new ideas into drug candidates and patient therapies for markets around the globe. 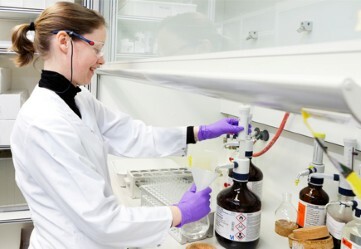 Not only do we maintain Immunology Research & Development hubs and commercial centers in the United States, Europe and Asia along with global clinical trial operations, but the Johnson & Johnson Innovation Centers operate in some of the world’s leading scientific hotspots to identify the next big ideas. Complementary research can often be found in academic institutions, where we seek the best minds to offer different perspectives on key areas of interest for our portfolio. These valuable insights often result in new approaches to assessing targets and progressing differentiated compounds for autoimmune diseases. Scientific discovery is our highest priority. To accelerate the understanding of diseases and patient needs, we connect with public and private organizations through consortia that include pharmaceutical companies, government or independent research organizations and key opinion leaders. Large groups like these further expand our reach and serve as platforms to source early-stage external innovations. Driven by an entrepreneurial spirit and inspired by the needs of patients, we have a passion for leveraging the science of immunology and sharing this knowledge with internal and external partners. Click here to learn about some of our unique partnerships. If you have a licensing candidate or program idea that you feel may be of interest to Janssen Research & Development, LLC, we invite you to submit this idea on the contact form located here.